Naughty Dog Already Working On DLC, Improving Their Engine For "Next Project"
Looks Like There's Definitely More Multiplayer Uncharted 2 On The Way. Sony are in charge of publishing, distributing and promoting their game now; leaving the team at Naughty Dog to take a break and look to the future. And the first thing on the cards is DLC for Uncharted 2: Among Thieves. "There will be downloadable content, yes. "What you'll probably see is more of the competitive type: more maps, more modes, stuff like that. The co-op stuff is hugely time-intensive and the size of it - the physical download size - is huge, so that's probably not an option. Richmond also detailed his fascination with co-operative gameplay. He showed desire to take co-op gameplay to the next level with Naughty Dog's next project. 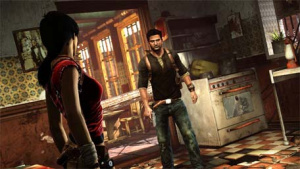 And exactly what is next for Naughty Dog then? Richmond announced that the developers are already working on the engine for whatever comes next. We can probably guess that the next game out of Naughty Dog will come from either the Uncharted or Jak & Daxter franchises. It'll be interesting to see whether they put Drake on hold for a few years, or continue to pimp Uncharted as a big franchise.